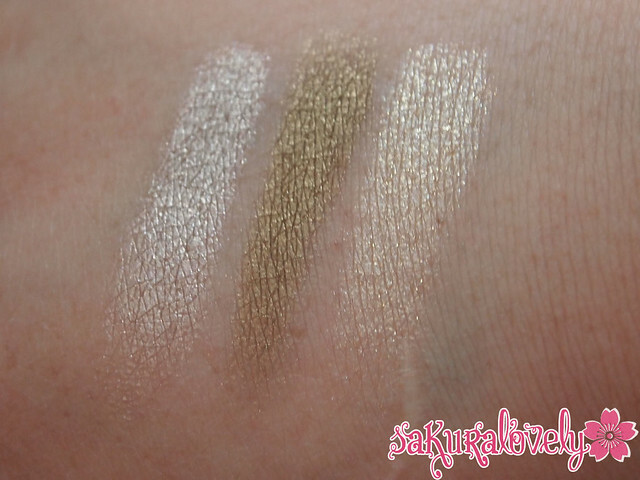 L’Oreal Colo[u]r Infallible Eyeshadow Collection | sakura, lovely. – The jars are plastic and have a plastic insert – MAKE SURE YOU KEEP THIS. The shadows crumble easily when poked or if the surface is poked and the plastic insert helps re-compress the shadows which apply like a powder/cream hybrid, though these are definitely powder. 001 Time Resist White: A sparkly, shimmery, white. This is a bit too frosty for me to use as a hilight but if I’m wearing really bright looks I don’t have similarly coloured bases for, this is my go-to as it doesn’t alter the colour of powder eyeshadows much (if at all). There is no 003, I’m not sure why! 005 Purple Obsession: A pearl-finished dark purple. 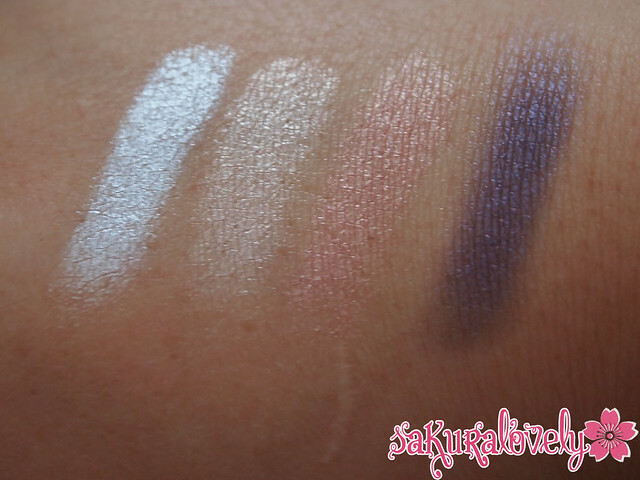 It’s much brighter in the swatch than it appears on the lid for me! 006 All Night Blue: A shimmery navy blue. This is one of my favourite colours, and the only thing comparable in my collection is the Hello Kitty Charmmy Eyeshadow stick in Navy – but that has a bit of red-toned glitter. I love this shade! There is no 008 that I can find either! 009 Permanent Kaki: First off, I feel like it should be KHAKI, but I am not in charge of spelling. A satin army green. You’ll see this in use in my upcoming SINS post! 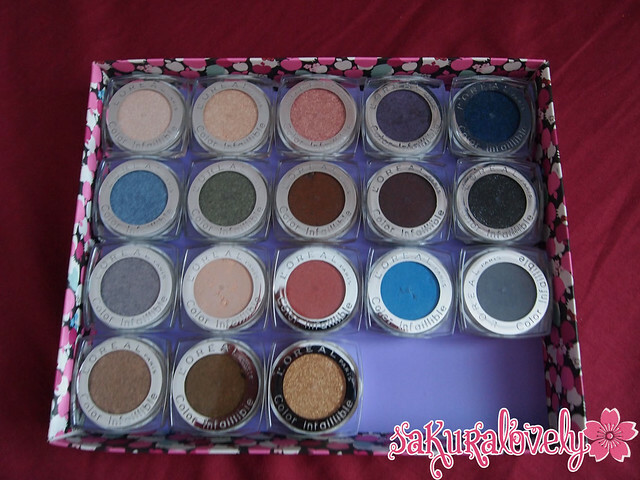 There is also no 010, or 011 coloured eyeshadows – I wonder if these exist but just haven’t been released yet! 013 Burning Black: A reddened burgundy black. This is the closest dupe for an Armani Eyes to Kill Silk shadow (002 Lust Red) except it is less sparkly. 014 Eternal Black: A matte black with silver sparkles. When I first swatched it I thought this was a metallic black, but I was sadly wrong. 015 Flashback Silver: A shiny silver – exactly as it sounds. These next Infallibles were part of L’Oreal’s summer collection, and unlike the rest of the line (except for the missing numbers) these are matte. I find the texture quite odd and lacking in pigmentation when compared to the rest of the line! 016 Coconut Shake: A matte cream. I’ll use this if I want a toned-down neutral look (i.e. for work). Also makes a good brow-bone hilight for more subtle looks. 017 Sweet Strawberry: A matte reddish-pink. I wanted to love this because of the colour but it kind of makes me look like I have pink eye. Might try it as a blush next time I pick it up! 018 Blue Curacao: A bright turquoise blue. This is very similar to Sugarpill’s Afterparty but… matte. 020 Pebble Grey: A matte medium grey. I think this would be a good base for a smokey eye, but it is kind of muddy on me. These newest lovelies were a CP from my dear Vicky and are part of L’Oreal’s fall collection L’Or L’Or L’Or. Two additional shades were released in Singapore and I’m trying to track those down! 021 Sahara Treasure: A shimmery champagne. I love this colour. 022 is Emerald Lame and 023 Black Onyx can be seen here on Rouge Deluxe. I’m tracking these down! 024 Bronze Goddess: An old gold colour, this is probably my favourite Infallible hands down, and I haven’t WORN it on my eyes yet. So pretty! There is no 025 or 026 as far as I can tell! 027 Goldmine: An shiny white-gold. This is the Infallible with the most shimmer 🙂 So pretty! I love all of these (except the matte ones) and I hope this post has convinced you track down a few to try! The wear time on these is excellent, and they apply nice and smoothly over a primer. 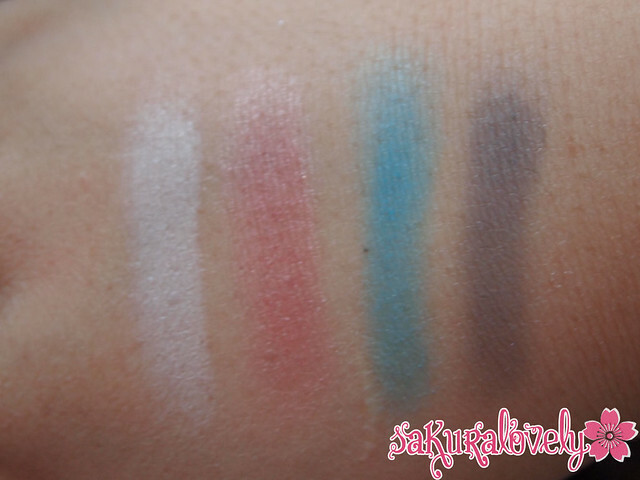 I showered with these swatches on and still had traces after soaping up and scrubbing for a few minutes! They come off easily with makeup wipes or a bi-phase remover. Your collection is really impressive! So many lovely colors! I have only one, which was gifted to me by the lovely Vicky and it is Time Resist White. I really like it and use it on the inner 1/3 of my eyelid. Good luck in tracking down the missing colors from your collection! Thanks Kat!! Time Resist White is a good hilighter but I’m a bi too dark for it – it definitely shows up WHITE on me! That’s an amazing collection that you have there! I have a couple of these but haven’t really been using them much, will do so soon! Something about how these (and the ETK) wear clicked with me so I really do enjoy using them – it helps that they’re relatively inexpensive! I absolutely love these! In fact, I think they’re easier to apply than the ETKs – less glitter fallout! I’ve never had an issue with glitter fallout from the ETK – I apply those with a 239, and these I tend to apply with my finger (or the 239, depending on how lazy I’m feeling)! The only one I own is forever pink which I think is more peachy pink haha! Tee hee – thank you for helping me get the matte ones Sofie!! If you see any numbers I don’t have please just buy them, I will pay you back!! i love the new shades u got too! i cant wait to see ur whole collection!! WOW!!!! These look like sweeties! So cool! Do you mind me asking where you are located? I actually just picked up Emerald Lame and Black Onyx but I’m not familiar with the matte dark blue/grey or the dark red frost – and I haven’t seen them in Calgary yet! I’m from Edmonton actually. The matte blue grey (I’m not sure of the name, it might be Pebble Grey but again not sure) I saw at Superstore and Shoppers along with Coconut Shake and Sweet Strawberry (L’oreal fall collection with Eva Longoria) and the others I mentioned I saw at Rexall (the L’Or Collection with Halle Berry?) – they also had Sahara Treasure and Goldmine. Good Luck! I actually have all of those colours – Pebble Grey, Cocout Shake and Sweet Strawberry are the matte colours (16-20) which I find weird haha. I’ll definitely have to check out Rexall though! They aren’t as prevalent in Calgary so I never go there 🙂 I was lucky enough to have a friend mail me Sahara Treasure and Goldmine as well as Emerald Lame and Black Onyx. Thanks for the heads-up! Thanks for checking Cindy! I actually finally saw a full display at London Drugs and picked up Golden Mahogany today – Bronze Divine is the same number as Bronze Goddess so I think they maybe changed the name for different regions but I’m going back tomorrow to double check haha. 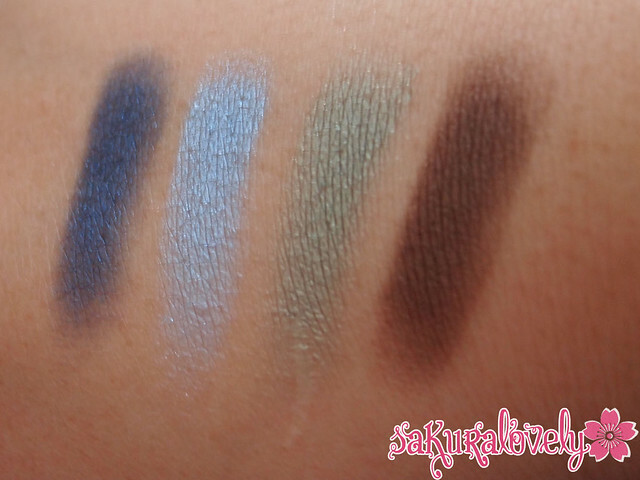 I picked up the 3 mattes one and actually love them, BUT they only work well when I use a flat synthetic brush, and quite firm, like the MAC 242, then they are dreamy, seriously the gray is perfect, I hope they come up with more in the future. I saw a matte black one in Europe, I’m jealous. Golden Mahogany is not a true red but more like lets say Maroon or Heritage Rouge pigments from MAC. But it’s a strange color that change completely depending on were you apply it and aside what color, it can look all the way from a rusty brown to almost a true red. I found it strange that the display in Canada doesn’t advertise the red but the promo of the one in the US used it but they don’t sell it there? Weird marketing. I just swatched Golden Mahogany and I love it!! I truthfully have NO Idea how L’Oreal is marketing these – when they first came out they ran a few contests but since then I’d heard nothing about them and the Canadian website hasn’t been updated with the L’Or L’Or L’Or collection so I had no idea it was even coming to Canada! I’ll need to try the mattes again, though I don’t have a 242… I’m sure I have a similar synthetic brush somewhere! i’m convinced. thank you! i will definitely be getting the neutral colors and maybe the purple, khaki, and black shades too. They’re released in Singapore? Dang, I’m off to the drugstores tmw! Hey I also live in Canada! Where did you purchase these? I havent seen all of these colour’s before? You can purchase these at WAL-MART, Superstore, London Drugs, Rexall, Shoppers Drug Mart… basically anywhere that stocks current L’Oreal collections. Haven’t seen them at Zellers though! So I’m a little late in the game apparently and just started collection the eye shadows. I have been to no less than 13 walmarts, rexalls, pharmaplus, shoppers drug mart trying to find all the colours I can and the one colour that I have been DIEING for is Blue Curacao and I can’t find it ANYWHERE! It’s so disappointing. I know you posted this months ago but how many do you have now!! I have 28 now 🙂 Blue Curacao was briefly available in the UK and looks like its permanent in France so if you have friends there they may be able to help you! Where buy?? You know some websites where you can buy?? Donde las compraste??? Conoces alguna pagina de internet donde se puedan comprar??? Can we use the coconut shake as a primer on tanned skin tone? ?